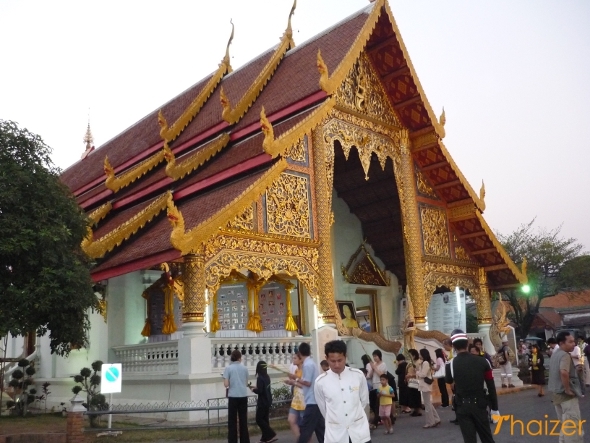 Visitors to Thai temples (wats) may find the atmosphere surprisingly relaxed as they often serve as local community centres. Within the temple grounds children can sometimes be seen playing games of football or basketball and monks may engage you in conversation. 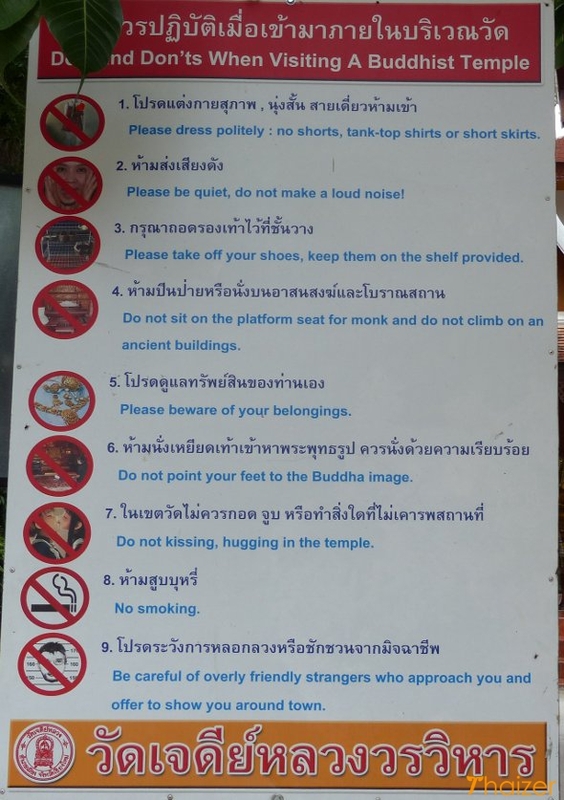 However, there are some important things to note before visiting any Thai temple. 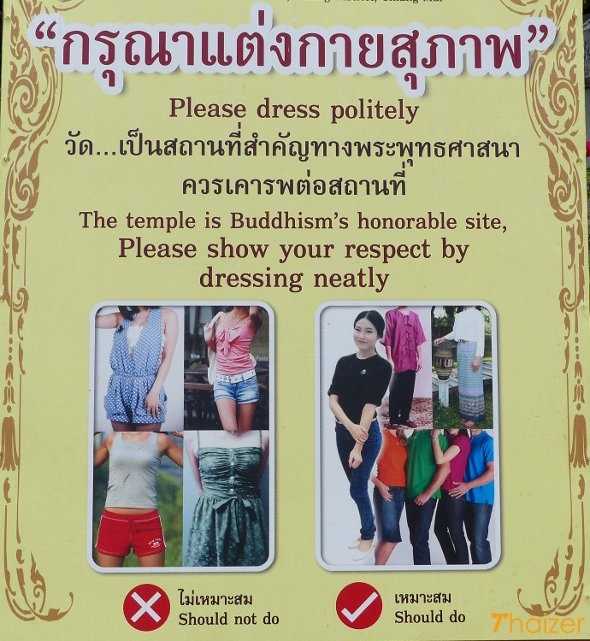 Always take off your shoes and hat before entering the temple (and indeed any room where there is a Buddha image). Even if there is no sign in English, this should be fairly obvious from other shoes already lined up outside. If you are wearing a hat take it off before going inside, but don’t place it on top of your shoes because of the association between the head (high status) and feet (low status). It’s bad manners (and bad luck) to place your foot on the raised threshold of the wat. Always take care to step over it. This applies to every building in Thailand that has a raised threshold which is traditionally there to keep out evil spirits and is also the home of the guardian spirit. Inside the wat, keep your head lower than Buddha images and monks. Don’t point the bottom of your feet at Buddha images or monks; this is why you will see Thai people kneeling down with their feet tucked behind them. Dress politely which means, at the very least, covering your knees and shoulders. In reality much of it is common sense and to an extent, doing as the Thais do. If you’re not Buddhist you won’t be expected to carry out any of the religious aspects of the visit, but obviously keep in mind that local people aren’t there to provide you with photo opportunities. If you do take photos, take them discretely and from a kneeling position. Leaving a small donation in the collection boxes will go towards the upkeep of the temple and earns merit for the donor. All Buddha images are sacred no matter how big or small or what condition they may be in. Treat them respectfully which means no touching or climbing. The Bo tree is also sacred because the Buddha achieved enlightenment whilst sitting under a Bo tree. Within the temple compound the Bo tree is usually easy to recognize by its large size and sprawling branches. Very often the tree trunk is also wrapped in saffron cloth.